After a few minutes I wrote back yes. But then I attempted to make sure everything was working as I always do and ran through a test. My code editor had a bug. 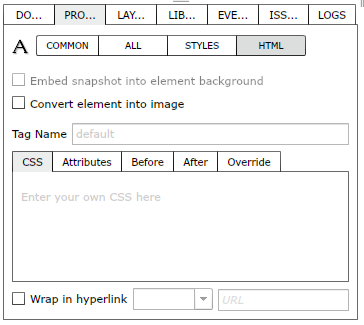 I fixed that bug and made a few other changes and now, now you can drag and drop a PSD onto this page (or app) and it will create your HTML web page, HTML, CSS and all. 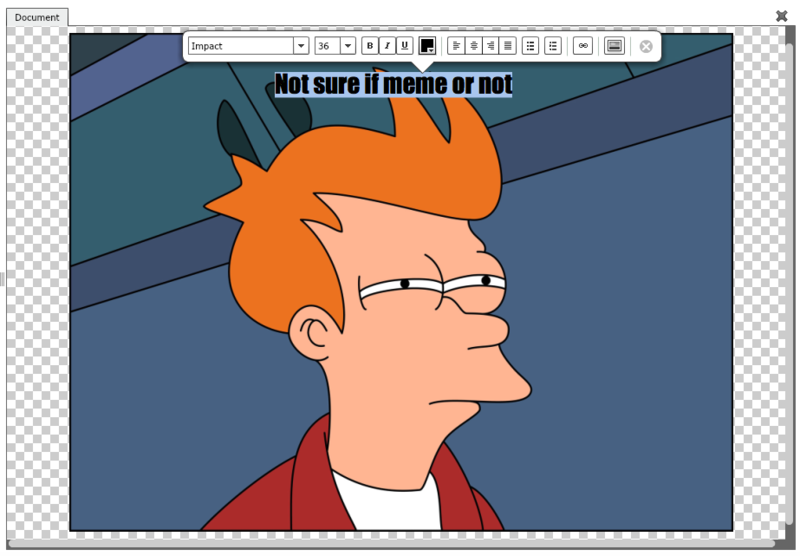 This post will show you how to create a meme all from within your browser. 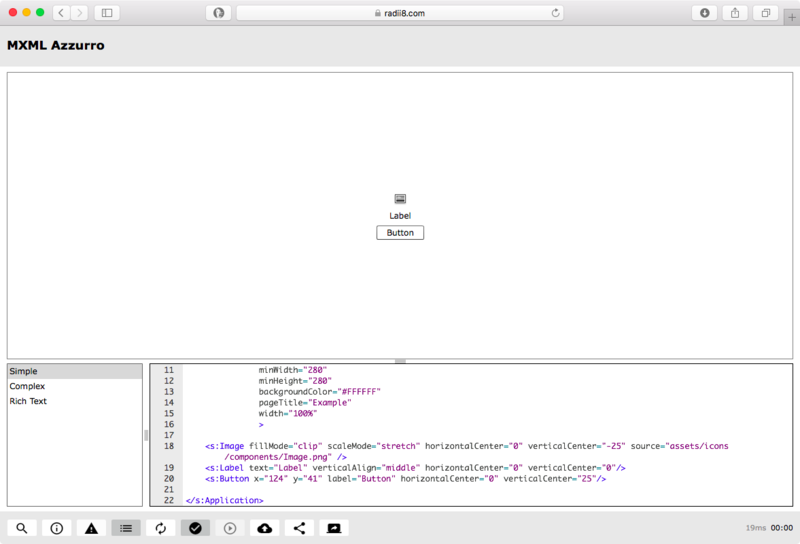 First open Radiate in your browser and create a new document. Note: You will need to have Flash Player enabled in your browser or you can download the desktop version here. Next, find the image you would like to use as a background. 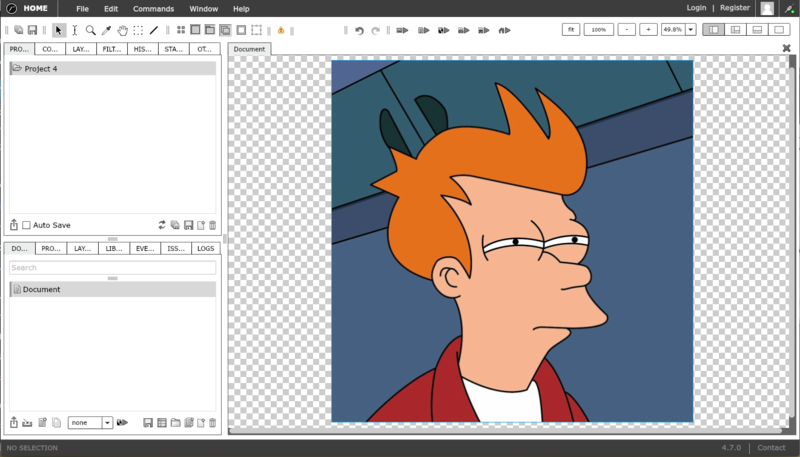 For our example, we will use Fry from the show Futurama as our background. 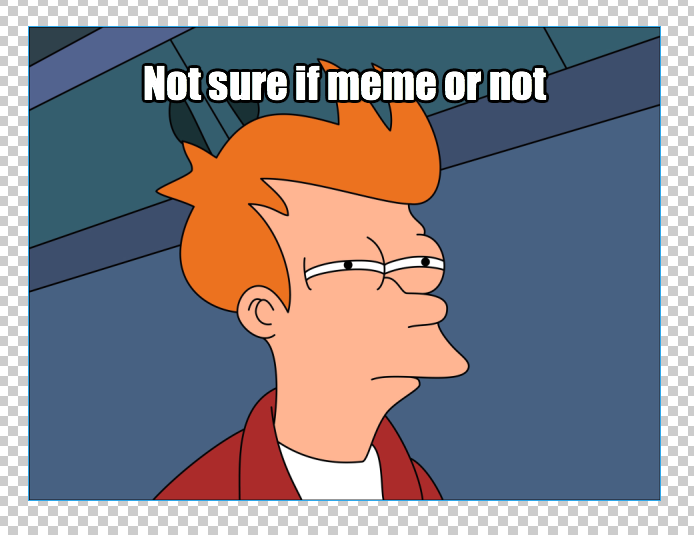 You can search Google or DuckDuckGo and find common images used in memes. When you’ve found one save it to your hard drive. Then drag and drop it onto the browser window or click the File > Import Image. 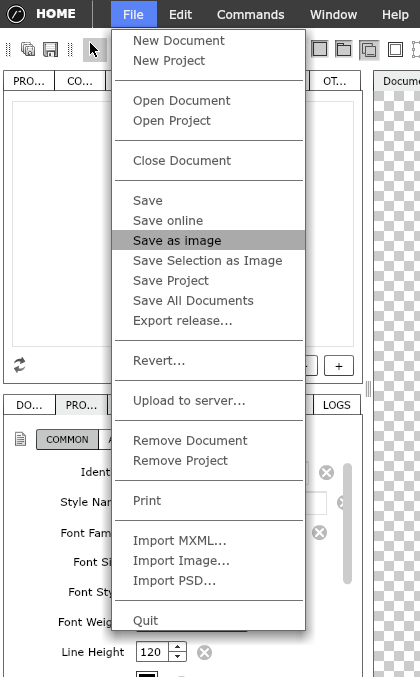 This will open a file dialog where you can select the image and click open and it will be added to the design area. Now if the image is larger than the design area then it will be resized to fit. Now our document and image content are the same. If we didn’t do this we would see that border on the right edge when we export our image. 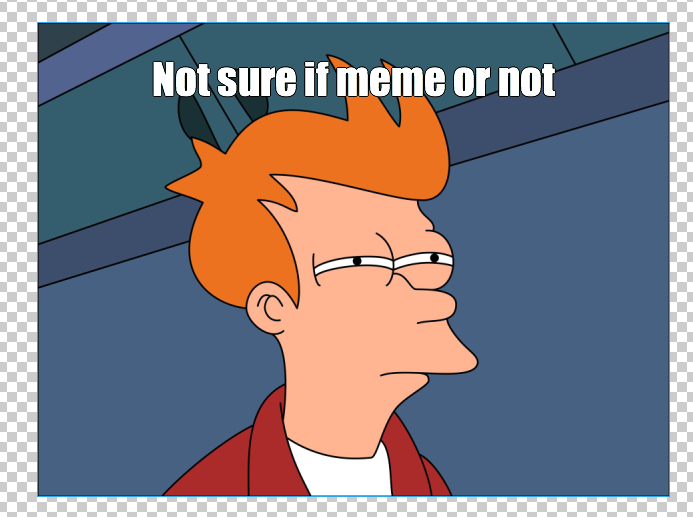 But since the original image is larger than the design area we need to resize to fit. Click the fit button at the top right corner of the window. Now we can see more of our image. Notice the zoom percent went from 100% to 49.8% (or whatever it is with your image). Next we want to add our text. Click the Text tool. Now, in the design area click near the center of the image. The text editor call out shows up. Type in some text. The text size may not be the same as what you see above. To change the text size select all the text (Command + A on Mac or Control + A on Windows) and then choose a font size in the font size dropdown list. Next we can change the font family using the font family combo box. When we are done typing we can click anywhere else besides the text field and the text call out will close and it will complete our text editing. You can also click the Selection tool (or any tool) and that will close the Text tool editor. You will notice two things. 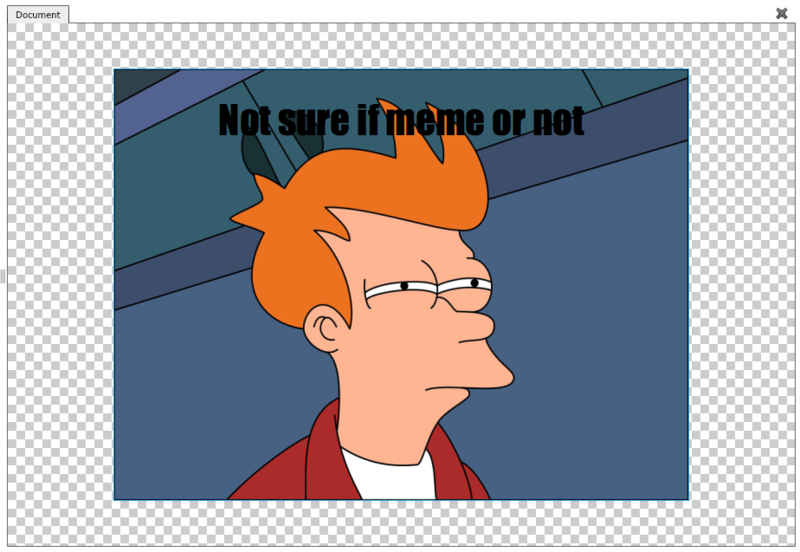 The text in standard memes are white and there is a border around it. With the Selection tool selected double click on our text. This will temporarily open the text editor call out, select the text and change the color of our text using the text color selector. While the text looks easy to read with this background it may not be easy to read on a lighter background. To fix this we will add a border around the edge of the text. Switch to the Filters tab and click on the Add Filter button. 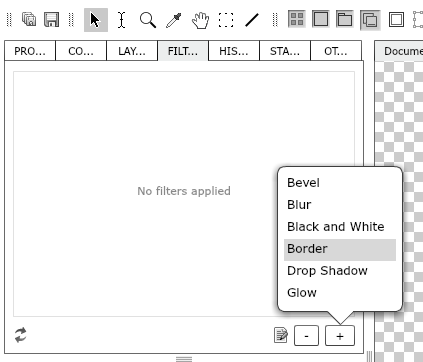 Make sure our text field is selected and select the border filter. Now we can see a thin border around our text. We can add more weight to the border. Double click on the border filter. This will open the property inspector for our filter. With the border weight at 2 or 3 our text is easier to read. Now we might want to save our meme. This will open a save dialog. Type in the name of your meme and click save. When you drag an element around in the design view guides will appear when you are near another element. When you drop the element it will snap to the edge of the other element. 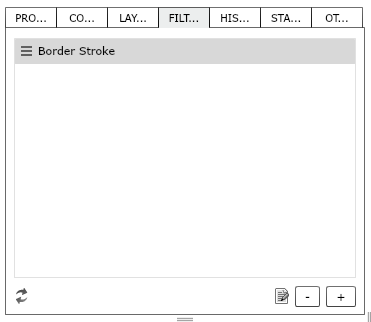 You can enable this by checking the Snap to Element Edge button in the Selection Inspector. When it’s enabled if you want to temporarily disable it hold down the Command or CTRL key. Drag and drop an SVG or FXG document onto the application and it will import it. Not all features of SVG are supported at the moment. If you come across an issue send the SVG code. If you it has a lot of layers it may take a while to import. To make using an imported SVG document, lock all the descendant layers. The Graphic container is the same as the Group container but the contents are scaled. Now when you resize a text field you have the option to increase the font size which is different than resizing the text element. To enable this hold down the alt key and the shift key when using the Transform tool. Do not set the font size in the pop up if you use this feature. If you’ve ever needed clip art for a project it used to take a lot of time to find images released into the Public Domain under Creative Commons CC0. With the new Image Gallery you can now search and import right into your document. To open the Gallery, select Open Gallery from the Commands menu item or open the Library Inspector and click the Open Gallery button. 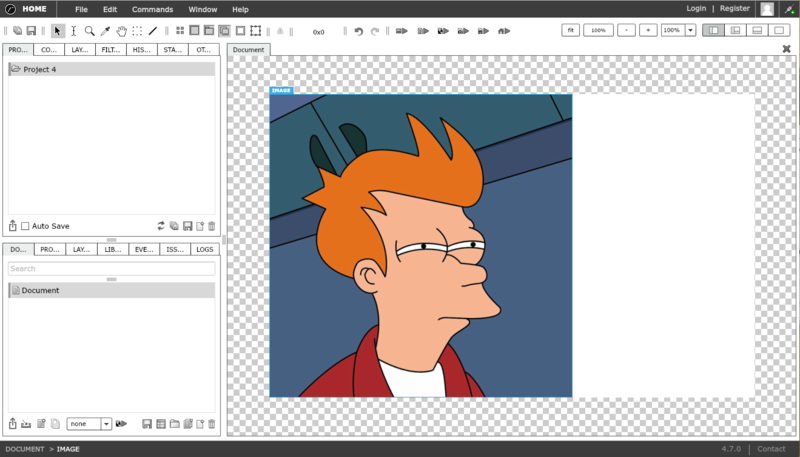 If you plan to resize the image, go into the Properties Inspector and enable smoothing and set smoothing quality to high. This will increase the quality. There are group components that position and size elements horizontally, vertically or tiled. 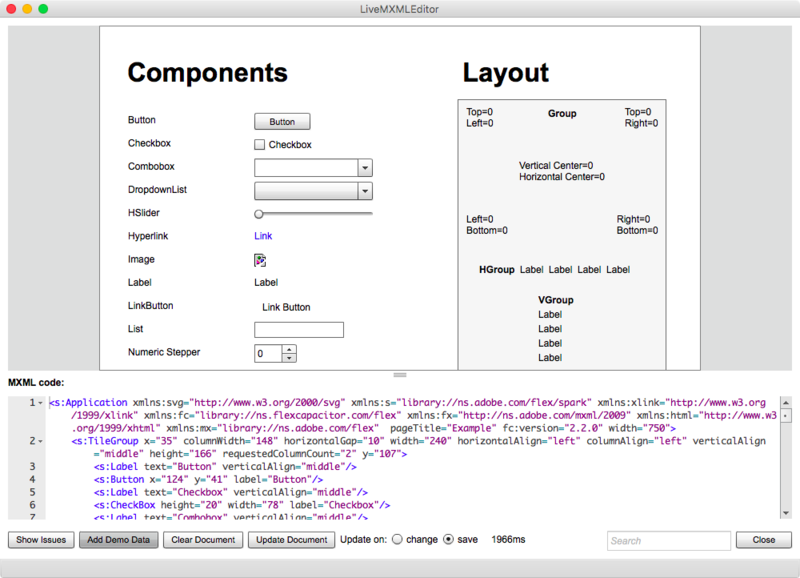 There’s also the default basic layout group component. This supports x, y, top, left, right, bottom, vertical center and horizontal center properties. 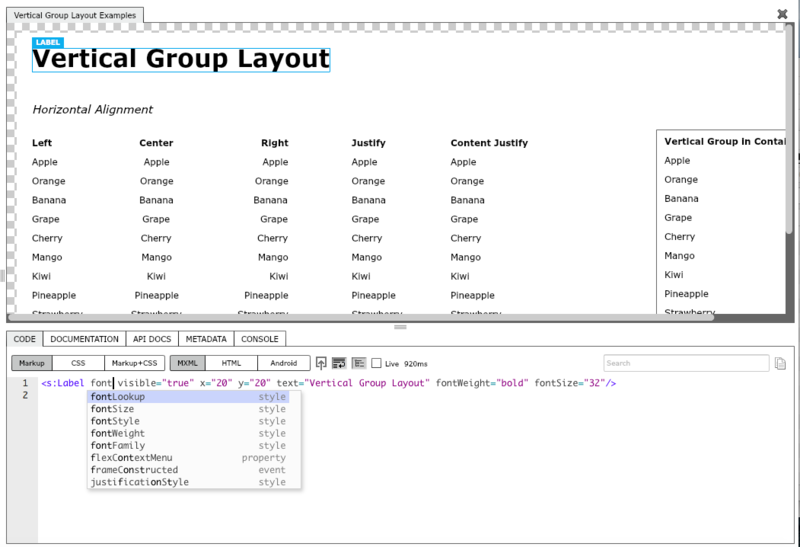 By default you can drag and drop elements from one group to another. HOWEVER, if you don’t want to do that and you want to drag and drop around the same group you can disable this now. To disable drag and drop into groups click the icon in the Selection Inspector. Dragging and dropping can appear slow on older machines if the Property Inspector is selected. When selecting an element the Property Inspector has to be rebuilt, so dragging happens after the property inspector is built. This can cause dragging to appear slow. Until there’s a fix, switch from the Property Inspector to another view when you are doing extensive dragging and dropping. – Added round to integer option so dragged values will be rounded to whole numbers or fractions. Click the x and y positions label to switch between them. – Fixed properties inspector not getting deactivated. 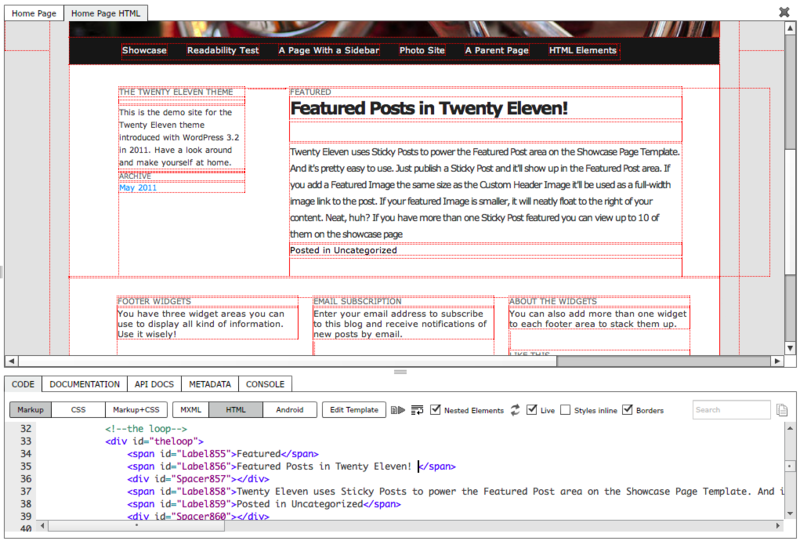 The property inspector makes drag and drop slow when switching to a new element. Close the property inspector when dragging around. – Added trim transparent pixels from images. Select this item from the Commands menu. In this release the browser version has been upgraded to match the desktop version. With the browser version you do not need to install anything. You can visit the page and you will receive the latest version. You don’t have to download an app. There are benefits to having applications run in web browsers. In this release we’ve fixed a bug so you can run the desktop version without an internet connection. We’ve also added code completion while editing MXML in the code editor. We’ve added in the class registry so any of the Spark, MX components or classes can be created via the code view. You can now press CTRL+Enter (or CMD+Enter) in the code view to apply your changes to the design view or press CTRL+Space bar to show code completion suggestions. There is also a rebuild option in the HistoryInspector to rebuild the design view if part of the layout needs rebuilt. In the browser you can now drag and drop images right onto the page and they will be imported onto the design view. The text tool has been fixed when adding text over groups. 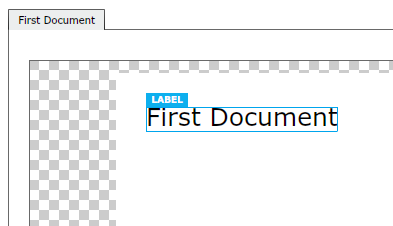 It removes the border around the editable text. Locked components on the design view now show a red border around them. This applies when you try to select components that are inside of groups when group selection mode is enabled. Many additional bugs have been fixed and improvements made. Download. changed to using ApplicationLoader class to load application locally. Fixes layout issues when not online. showing default gravatar icon locally since it’s not coming through. sent email requesting permission to cache icon. read somewhere it was ok but sent anyway. One thing I’ve wanted to achieve is live MXML rendering. There has been a live rendering mode of HTML markup in Radiate for a few versions now and in Radiate version 4.0.0 we introduced basic MXML rendering. But if you just wanted code pure MXML without any application now you can. The MXML renderer is here and it’s online. Using this application you can code MXML and see it rendered live. This application does not support certain tags and does not interpret ActionScript. If anyone is interested in upgrading the UI please contact me. If you need a code editor for your own Flex or AIR application or drag and drop support for your Flex application in the browser or you would like to support future Flex products like these check out the products page. It is said that in the beginning it took God seven days to create the heavens and the earth. That’s incorrect. It actually took one day and six days to get it to look right in Internet Explorer. For the last ten years I’ve spent many days writing tools for web development. I work in HTML converting advanced desktop markup language into HTML markup. I work on conversion tools frequently. They say to use the best tool for the job. 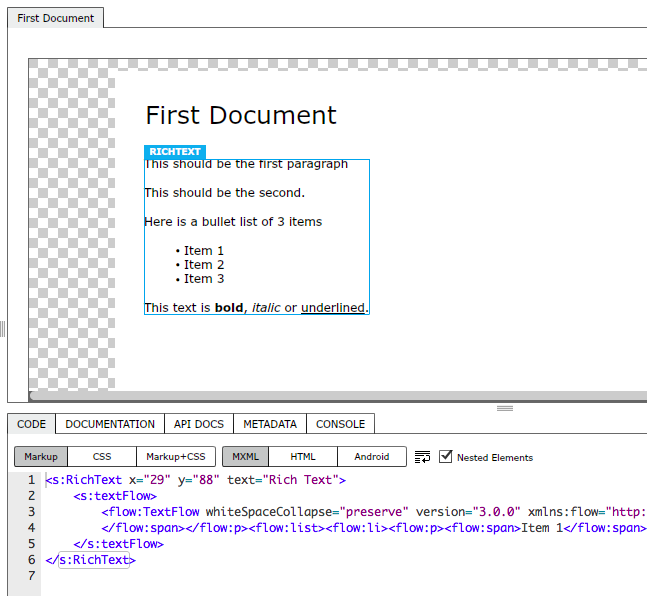 HTML markup was originally created for formatting text documents. I’ve come to the conclusion that HTML markup is not the best tool for the jobs that many of us have to do. It is vastly under powered. It’s time for a new markup language. All powerful markup languages have certain goals and expectations. While CSS has advanced HTML markup has not. As I’ve said, I convert from various markup languages to HTML markup. It is possible for HTML to achieve some or all of these through the use of specific tags, style sheets, display modes, box sizing models, transform matrices and so on but after using advanced layout markup there’s no going back to the caveman level that HTML has been stuck at. We all know it. I’ve worked with many markup languages and MXML satisfies all these goals (the open source Apache Flex SDK is one tool that compiles MXML). I would suggest we look at MXML as the next standard for markup in the browser. Continue reading. 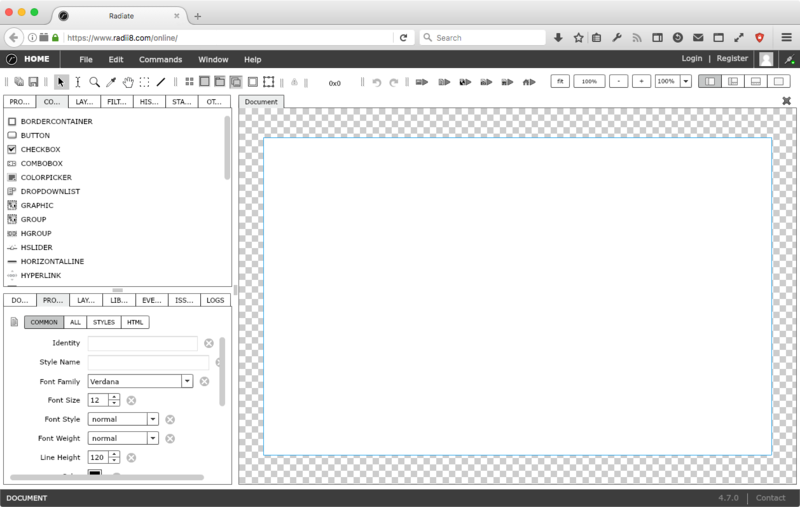 MXML was created to handle and render layouts from multiple design tools. It was designed to support advanced layouts and typographic from the leading design tools in the industry: InDesign, Illustrator, Photoshop, Flash and PDF and more. It was created to support vector graphics, raster graphics, advanced multi-language typography, states, transitions, cascading style sheets, bindings, filters and more. It is a document that holds a vast description of design elements and presents them gracefully. That description is in XML format and can be parsed by any application. It is extensible and allows for additional namespaces without breaking or causing collisions. It is designed and meant for the web and applications. I cringe when I hear someone ask how to get started making websites with HTML. I get asked repeatedly, “Why do I have to do back flips to do a simple task or layout?” “Well, it’s because HTML was originally created to format a text document.” “I never expected creating a website was this challenging”. 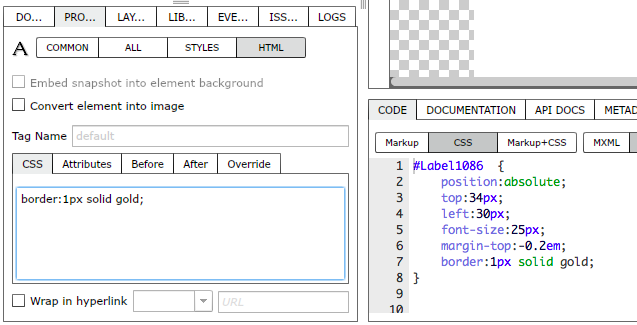 After years of using various markup languages from HTML, Macromedia MXML, Android XML, Microsoft XAML, Illustrator XML, InDesign IDML, Flash XFL, PDF XFA, SVG, FXG, TLF and more I can say this with confidence, HTML IS NOT A SUFFICIENT MARKUP LANGUAGE FOR APPLICATIONS! It is for documents! As a web community we need an updated markup language! MXML is the most advanced I have encountered in all my years. Anyone implementing MXML can verify it their renderer works by comparing there MXML rendering using Mustella testing framework or by simply compiling it with the open source mxmlc MXML compiler in Apache Flex or parsing it live with the open source Live MXML Editor. As a web community using many different frameworks and technologies we desperately need an updated markup language now. Would it be a good idea to adopt MXML as a starting point and continue to develop it as an open source community? You can view the online MXML editor here or download the Live MXML editor / renderer here. You can download the open source Apache Flex SDK here and compile MXML into applications that run in the browser, on the desktop or on mobile devices. MXML is used in all of them. You can read my previous post about MXML here. Note: Would it take a long time to develop it and gain adoption? It may. Or it may be possible to parse MXML and reuse existing code. It may take ten or twenty years for it to be adopted but we and our descendants will have something that makes much more sense than what we did. And the sooner we start the sooner we will arrive. But we have a head start with MXML in that we have software that already renders it and it can be used as comparison. It can even be used immediately with MXML parsers. We also have a head start in that the browser manufacturers can apply their existing layout rules to a new set of elements. Finally, the MXML compiler and MXML Flex SDK is open source so the parsing and rendering code could be compiled into the browser software and that is with or without plugins. In another form MXML can be compiled down to bytecode. One network request is much much faster than multiple requests over the network. Instead of ten to twenty seconds for your page to load it would take one to two seconds. Disclaimer: I’ve been working on a design and development tools that read and write MXML documents. It generates MXML for you as you use the design tools or allows you to see MXML rendered live. This software has been available for around 4 years. There’s no pay wall. You can download it for free or purchase a copy. But I’m not promoting my software. I’m promoting MXML. The reason why I’m promoting it now though is because I’m tired of dealing with HTML. Everything in the web and software world is advancing. It’s time for HTML markup to be part of that progress. There have been a few major updates this release that may cause issues. I hope to have a dot release to fix them but please report any bugs you find. Note: I’ve added the Live MXML Editor application (now updated to version 1.1) to the download page. 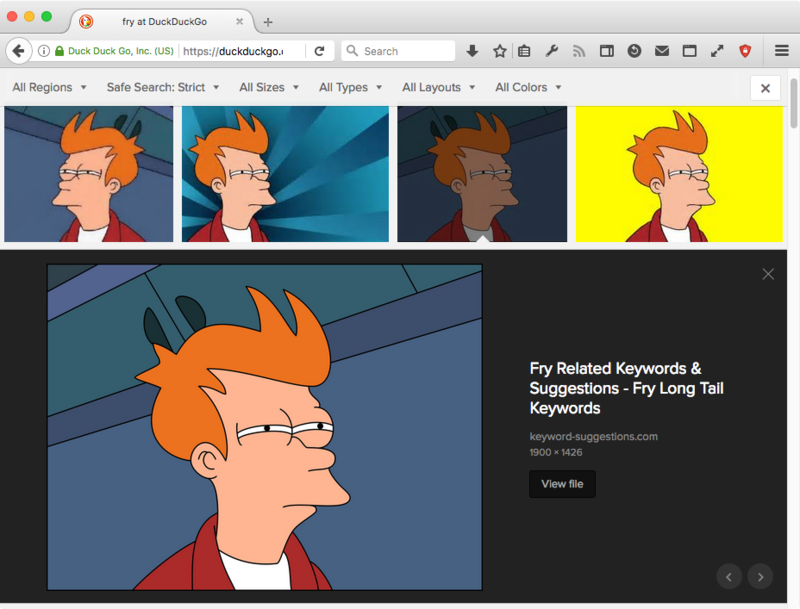 – adding option to embed image data in MXML when image is not uploaded to a server. experimental. does not export correctly when document is closed. fixed cases where element would disappear in DragManagerUtil. still occurs but not as frequent. – Undo does not work correctly when using live editing of MXML. Go to the history panel and click Open and then click the last item in the history list. This rebuilds the document. – Keyboard shortcuts for undo and redo do not work unless Selection tool is selected. Use undo and redo buttons or menu items. In this release the most significant change is stability in saving and restoring projects and documents. Next, in no particular order, is live rich text editing, customization of HTML output, better live HTML editing with scroll position lock, opening files from the welcome screen (through drag and drop) and better HTML export support with more styles exported. There are also more information messages to give you better feedback on asynchronous actions. This release also updates the build to latest AIR version to support native drag and drop, and more. 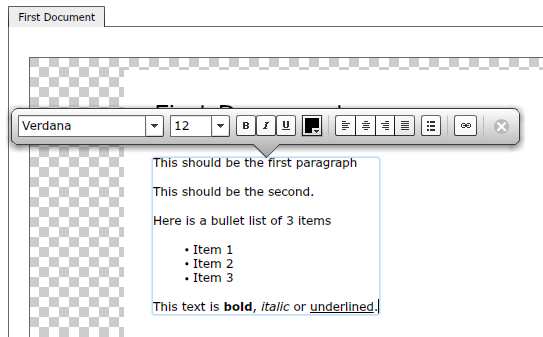 With rich text editing you can now format text using familiar editing tools. 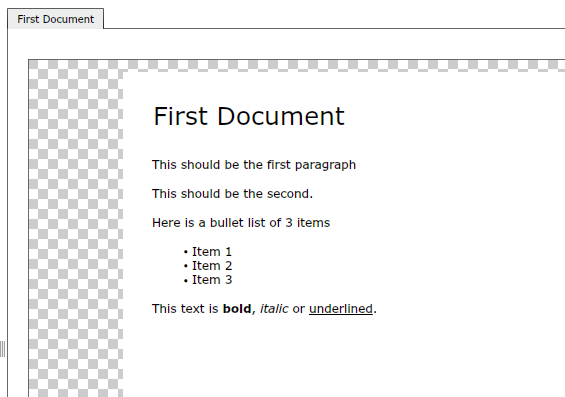 To use, simply drag a RichText component on to the design view and double click on it. A call out will open with an rich text edit bar. 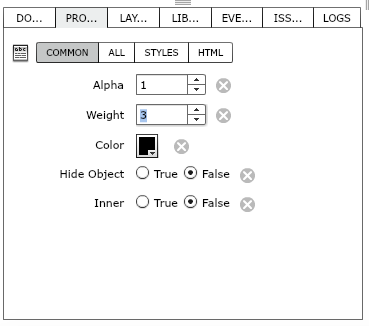 For example, select a Label component and then open the HTML section of the Properties panel. One of the most useful features is editing code and seeing the changes updated live. But when that content is scrolled off the screen, scrolling back to the last position gets old quick. With this update the scroll position is retained as you edit. You can’t see it in this image but if you could, you would see that as you type in the code editor the page remains locked at the scroll location even as it’s being updated live. Added RichTextEditorCallOut testing application. Can be removed or simplified. Added support to format text on the design view using a new RichEditableTextBarCallOut in Radiate. Experimental. Fixed bug where HTML text was being set as the content of a HTML TextArea. Now setting to normal non-formatted text.